TOP > EPICからのお知らせ > ふれあい座談会（ざだんかい） in 宇和島（うわじま）参加者（さんかしゃ）募集（ぼしゅう）！Casual meeting in Uwajima. Please join us! ふれあい座談会（ざだんかい） in 宇和島（うわじま）参加者（さんかしゃ）募集（ぼしゅう）！Casual meeting in Uwajima. Please join us! In order to realize the multi-cultural society in Uwajima, we’d like to hold a casual meeting by inviting foreign residents. Please come join us. We are very happy to interact with you and listen to your honest opinion! (4)“How to prepare for disasters” etc. 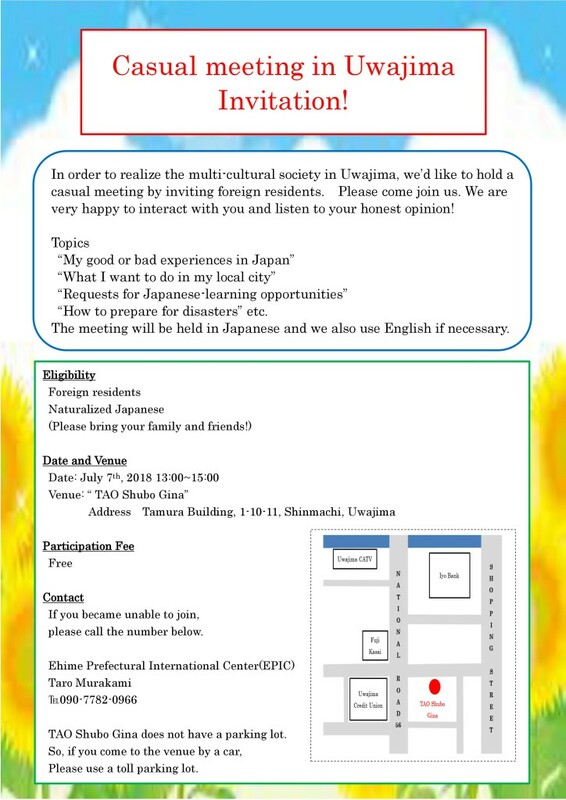 ■Others: The meeting will be held in Japanese, and we also use English if necessary. ■How to register: Please contact by phone or e-mail. TEL: 089-917-5678　E-mail: murakami★epic.or.jp　※Please change ★ into @ when you send e-mail. « 日本語集中講座（夏季）参加者募集！　Want to Try Studying Japanese?